UPDATE: Highway 8 re-opened by 3 p.m. Thursday, the Washington County Sheriff's Office reported. A gas line break in downtown Cornelius Thursday afternoon, Aug. 30, prompted evacuations of local businesses and a shutdown of highway traffic. 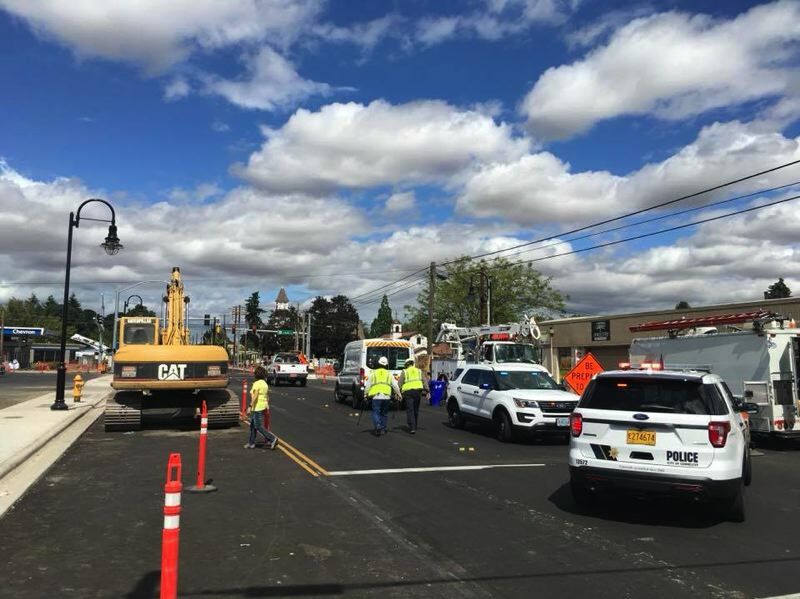 The Cornelius Fire Department said the "large gas leak" on 10th Avenue, in between Adair and Baseline streets, caused emergency responders to order the evacuation of all businesses within a one-block radius. David Nemeyer, a fire department spokesman, said the gas line that was damaged was a six-inch line. "That's a significant gas line," he said. It was not immediately clear what caused the damage. Nemeyer said it appears to have occurred during construction work. That section of 10th Avenue has been under construction for more than a year, part of a Washington County project to upgrade the north-south thoroughfare. The gas leak also prompted the closure of Highway 8 in both directions, Adair and Baseline streets, through the area for about an hour. "It's horrible," Nemeyer said of the impact on traffic at about 2:15 p.m.. "This was already a mess because of the construction." The Washington County Sheriff's Office announced at 3 p.m. that the highway re-opened. Nemeyer said the leak was quickly brought "under control." The construction company is cooperating, he said. The Cornelius Fire Department reported on Twitter at about 2:30 p.m. that NW Natural crews had "secured" the leak. The gas leak is officially under control, @nwnatural have secured the leak. We will be letting businesses open up once checks are made showing no gas build up inside buildings.